The new mosque accommodates about 100 people. It became the 30th mosque in the district. 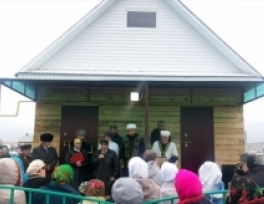 The opening ceremony of a new mosque took place in the village of Sarmash -Bash of Zainsk district of Tatarstan. 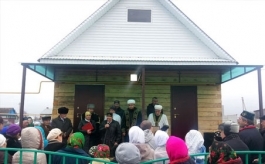 The event was attended by Deputy Mufti Rustam Hazrat Khayrullin, Imam - mukhtasib of Zainsk district Sagit Hazrat Kamalov, representatives of the district administration, invited guests and residents of the village. Rustam Hazrat Khayrullin told the audience about the virtues of prayer in Islam, and presented letters of appreciation to patrons, on behalf of the mufti of Tatarstan Kamil - Hazrat Samigullin, who have made a contribution to the building of the mosque.